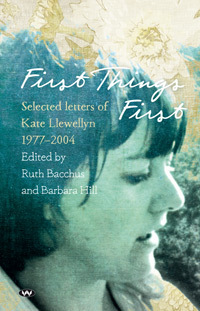 Since I couldn’t cover everything in my review of Kate Llewellyn’s letters, First things first, edited by Ruth Bacchus and Barbara Hill, I decided that a follow-up Delicious Descriptions on a specific aspect of the book, her discussion of her reading, would be in order. I’m making the assumption that, like me, you’re interested in what writers think about the work of other writers. Llewellyn mentions many writers – poets and novelists – in her letters, and is generally positive. I can’t (and shouldn’t) share them all, of course, so have selected a few that particularly interested me. Well, that’s rather a breathless flow, but it captures quite a lot about what Llewellyn gleaned about Stead from the letters, about Llewellyn’s reaction to that, and about Llewellyn herself. In another letter, in 1993, she comments on a negative drawing of Stead in The Australian which described Stead as “monstrum extremum”. Llewellyn’s response to that was a “4,000 word piece on Stead and the way Australia treats its artists”. Go Llewellyn, eh? Besides the fact that she so loved a Jolley book, I was fascinated to read about a writer admiring another writer so much she wanted to do a writing class to improve her own writing. It reminded me that we never stop learning or wanting to hone our skills. I am reading R. Drewe’s A Cry in the Jungle Bar (Picador). I am not mad about this book but will read anything of his to see how he arrived at Our Sunshine … We had a talk at the book fair and I told him how sorry I was he did not get any of the prizes (the Banjo was announced that day) for Our Sunshine. He said he needed the money … When he is dead the country with laud him to the skies and sell his book by the thousands and make a film of it and maybe his son will benefit … but until then, it is slim pickings for him. Our Sunshine is Drewe’s novel about Ned Kelly, and is a book I’m keen to read. The 2003 Ned Kelly film was based on it, but it wasn’t exactly an adaptation. Anyhow, here again is the issue of writers struggling to survive. I know there are those who are uncomfortable about literary awards but they clearly have practical value to many writers. Really, Marion, you know I admire your writing because the thing has a will of its own … […] … because long before I ever met you, I said so in print … and you just get a firmer and firmer grip on your style and wide range … no, range wider and wider … also your quite encyclopaedic knowledge is impressive, but not just that, as that would be a bore if it was only that, but it is illuminating and lovely to read and I learn and that’s a real pleasure … mictouricious (?) or some such word … from micturition … the verb to pee … no micturate is the verb I suppose … I barely went to school and it constantly shows … music and spelling were on the days I didn’t go. How better to end this post than on praise of our wonderful local writer, Halligan, that is written with such generosity and self-deprecating humour. I’m sure you can see why I enjoyed reading this book. Thanks for sharing those, they are really wonderful. I love how she uses the ellipses, they give her letters a breathless full steam ahead quality that is really endearing. They do, don’t they, Stefanie. You can feel her enthusiasm or energy or mile-a-minute mind in it. Elizabeth Jolley and Robert Drewe are two of my favourite authors in the whole world. Their writing is excellent (EJ unique I believe). I think about their themes and characters often and gratefully. Yet I found them both in Sydney charity shops – though have made sure to buy new since.. Thanks for commenting Carol, and welcome. I love that you love Jolley. She’s a favourite of mine. In some senses she reminds me of Jane Austen, though she is more interior. It’s her clear, unflinching eye on human behaviour that reminds me. I haven’t read enough Drewe but what I have I am drawn to. Need to read more of him.